Laviere is exclusively dedicated to creations with emerald, sapphire, tanzanite and ruby. Only diamonds of the highest grade are used to highlight the exquisiteness of these precious stones. 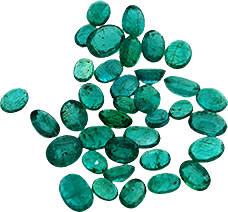 Since 1969, Laviere’s founders have cut the most astonishing coloured gemstones from famous mines in Colombia, Myanmar, Sri Lanka, Thailand, Tanzania and Brazil to create precious pieces of jewellery that are sold in prestigious boutiques worldwide. Over decades the company acquired an enviable team of expert stonecutters and craftsmen that handle each stone with savoir-faire and are well versed with the stringent criteria and standards of the colour, size and shape of the stones. Their uniform workmanship is amongst the best in the fine jewellery world and it is recognised by elite international customers, especially for the unique blend of the coloured gemstones. Their prestige in the industry inspired the company to expand their pursuits and in 1990 they started their own jewellery business. The vision was to present their customers with creations of the highest quality, crafted with complete control of every process: from the sourcing of gems at the mines’ sites, to the design and making of refined jewellery pieces. It was from this legacy that Laviere was born and, since 2012, the company has been offering sophisticated jewels crafted with the finest coloured gemstones. As it is well known, each gemstone is unique and characterised by unmistakable natural footprints. Laviere devotes itself to the art of selecting the perfect cut and set for every single gemstone to enhance its splendour and maximise its sparkle. Once upon a time, the Kingdom of Laviere flourished with wealth and happiness in the power of the almighty Adamant and his Queen Aura. Their love was deep, their contentment filled the fertile land of Laviere and their people lived in prosperity and opulence. Adamant, though, was not completely satisfied. He decided to leave Aura on a mission to conquer new domains and go to war. While he was away, Aura fell ill, became weaker as the days passed until one day, she completely lost her consciousness.Adamant was devastated and returned immediately. He called all the doctors in the kingdom at once to find the reason of Aura’s illness. No one could determine her condition. As time moved on, Adamant was losing his mind and became choleric towards his subjects. The people of Laviere grew fearful of him, were despaired and stopped working. The reign suddenly lost all its fortune. The land turned grey and life was fading away… The desperate Adamant finally appealed to the Wiseman of Laviere. The Wiseman explained that the key to restoring Aura’s health was to find the lost spirit of the triple goddess representing Harmony, Peace and Love. Three shining knights from three different lands far away heard of the downfall of the Kingdom of Laviere and came to its aid. They were Azure, from the land of Sapphire, representing Wisdom and Harmony; Venetian, from the land of Rubies, signifying Passion and Love; and Viridian from the land of Emerald, embodying Serenity and Peace. 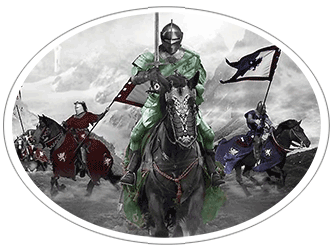 The three knights set out together on a quest to enliven the spirit of the triple goddess. In their mission, they realized that the only way to save the kingdom was to replenish it with what it lacked, the colours of life. By doing so, they were successful in uncovering the spirit of the triple goddess. Together they forged a new stone; a stone made of Sapphire, Ruby and Emerald and bound as one by Gold. They called it Laviere’s Stone. It combined all the traits of the three who forged it: Azure’s Harmony, Venetian’s Love and Viridian’s Peace. 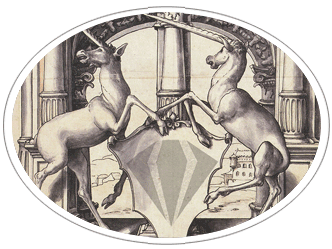 Two splendid Unicorns brought Laviere’s stone to Aura’s chamber. As soon as the Stone’s radiance caressed her pale face, she revived and smiled gleefully at Adamant. The supremacy of Laviere thrived yet again and the three knights were appointed Princes’ of the Kingdom. King Adamant committed himself to revere the spirit of Laviere’s Stone and ordered the unicorns to protect it for the eons to come.